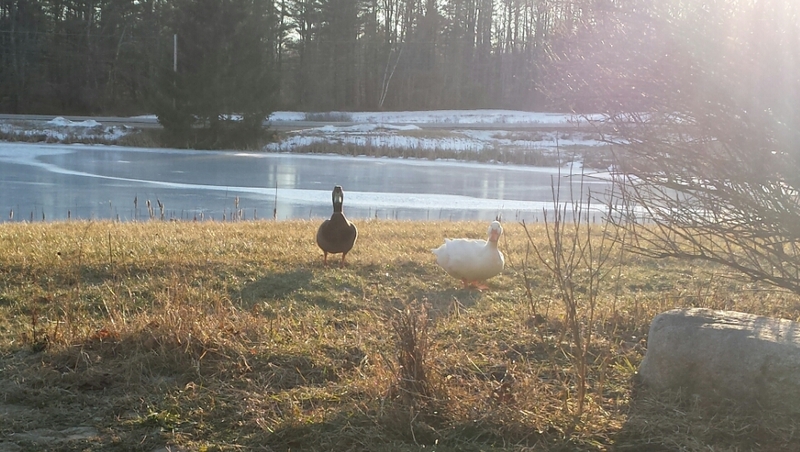 Even the ducks enjoyed the milder weather that exposed the grass for a couple days . 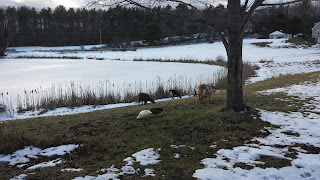 We know what the goats were doing--eating the thawed grass, picking out just the right clumps. We still don't know what the ducks found so exciting, there was no chance of an insect out and near the surface in this weather--do they eat grass too? Mr. and Mrs. 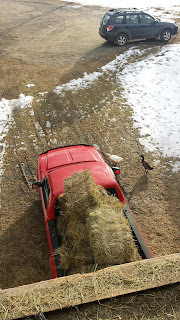 Duck take a few minutes out of their busy schedule in the heated wading pool to offer a helping inspirational quack or two while hay is being hauled up to the barn loft. Inspiration is always in short supply loading hay in the winter! Piper, Simone, and Star. Piper is one of the original goats in our herd, and she came from farmer Joel. She has never been bred, and we are hoping her date was successful with Eddie a few weeks ago. Piper is a taller goat, part Nubian and Alpine. Eddie, on the other hand, was much shorter, a Nigerian Dwarf. It made, I'm certain for an exciting date. Simone too, original came from farmer Joel, and has been bar n pals with Piper, since the beginning. Simone is self-appointed queen of the herd and is the oldest of the goats. We chose not to introduce her to Eddie, for that reason. She may be retired at this point. 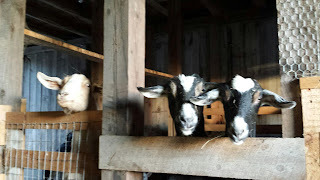 Star, the goat on the right, is one of Simone's daughters, and we are hopeful she was bred successfully with Eddie. It's hard not to have a great day after a greeting like this in the barn! Mr. and Mrs. Duck ventured into the front yard, because the snow has completely melted. I thought they were simply taking a look at the condition of the pond--which they did, but then spent an hour nosing around the brown leaves and frost. Were they just curious, or was there something for them to eat in the grass? The ducks really do live in a different world! Mrs. Duck has made a small indentation in the hay, in a corner beneath a board up against a wall, and has been laying an egg each day. It seems to have begin almost the same time the light began to grower longer during the day. 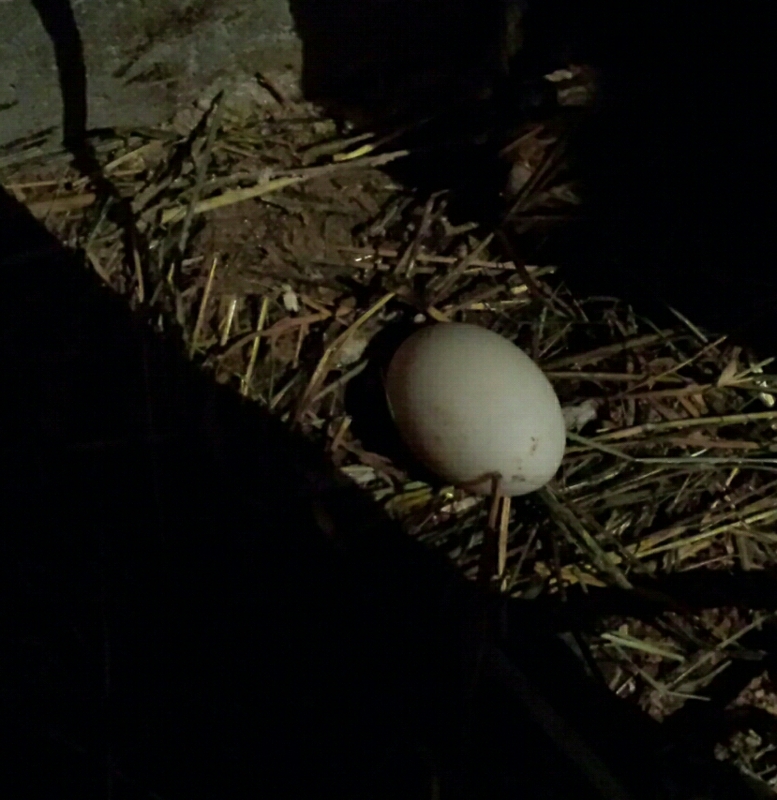 It is a wonderful sign to walk into the barn, when it is 15 degrees, snow on the ground, and a real bite to the air, to find a fresh egg. Mrs. Duck is not sitting on the egg nor does she seem protective at all at this time. There was no skating last year, and it seems there was very little skating the year before. We've had an odd mix of snow, sleet and rain this year, with some recent fluctuations in the weather, that has left the ice really excellent, with just enough ripples to keep you on your toes. After the last snow, I cleared off a path with the snowblower all around the perimeter. It was ready for the waxing moon, and i was able to skate one early evening by moonlight. I kept thinking to myself that there was nothing like skating by moonlight--I kept pinching myself, it felt like a gift. I remembered years ago, that my father took us skating, as kids, to a public park in Holmdel. NJ. I recall being amazed at how well he skated--very gracefully, and was able to skate backwards as well! I remembered, in the moonlight, that he would take each of our skates between his legs, and use a tool that hooked the cross of the laces and pulled them tight. He went eye by eye and tightened them, sending us on our way. I wondered if I'd ever told my son that his grandfather was a good ice skater, and for some reason, this seemed very important suddenly. This must be the beginning of a family heirloom. This oak library table was the source of many jokes and snide remarks over the years. Mom brought this table home many years ago--at least 10, when she and Dad were up visiting. I'm not certain where it came from, but it was mustard yellow originally, and in pieces. Off it went, as I said it would, to the shed, where it was moved several times, before it inhabited a corner, behind a make-shift workbench, beneath a canvas bag with old sweatshirts, and an ash bucket with a rusted bottom next to it.Each time the shed was straightened out, I thought about dragging it out to the roadside with a "FREE" sign on it. At one point, Bev saw it, and suggested it was something she wanted to undertake. This was a couple years ago. It was one of the things that was finally moved from the shed, when the recent tenants moved in this past fall. Like many of Mom's projects, this one expanded, because the hardware was no longer working, the pedestals were cracked and needed to be filled in, the finish on the top was in different layers and needed to be smoothed out, etc. 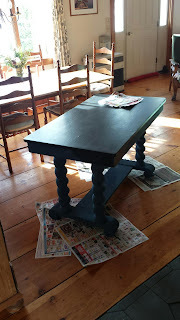 So the heirloom to be went to her ex husband's, who actually knows how to work on wood furniture, and he repaired the surface, drilled new holes for the pedestal legs, and returned it to us in a condition for painting. After painting, it went into the Air B&B room for the television. It looked beautiful. I was skeptical, but now there is a new story that involved our extended family and created this new heirloom, "The Oak Library Table That Mom Dragged Home." An ugly rumor started some years ago, which is absolutely true. After the holidays, before meeting me, the gingerbread house that Bev made would go into the trash, presumably because it was stale, after sitting out for a couple weeks. In my world, there is almost no such thing as stale candy or cookies...and certainly not gingerbread. So, each year, when the signal was given, I would begin the demolition process. Some years were faster than others, but it was always an excess. 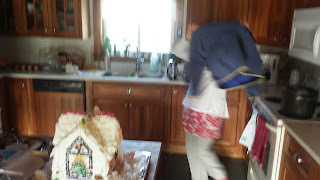 Each year, Bev would look at the carnage--point it out to friends, neighbors, and family, as though I was the only one in the world capable of such excess. All I can say is that those pink jammies in the picture are not mine, and a hunk of chocolate covered pretzel at the door is missing! 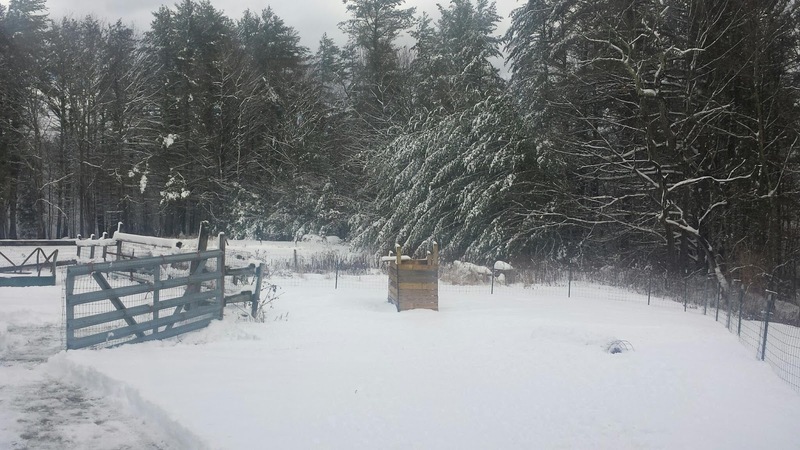 Although the accumulation of snow was not very high, the snow mixed with rain and sleet at several points in the storm, making it heavy, weighing down the evergreen limbs. 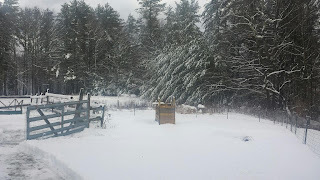 I watched our goats immediately run for the branches that were now low enough to the ground, from the snow, to eat. Fresh evergreen salad after the storm, and they all seemed delighted with the treat. I had often wondered what deer found to eat in the winter, and it occurred to me watching the goats, that while the storm may have brought chores to some of us, it brought a meal to others, heartily enjoyed on a cold winter's day! Uncle Levan's farm set stayed up slightly longer than the Christmas tree, but by only a day or two. It was wrapped and put away, with care, while i was at work. 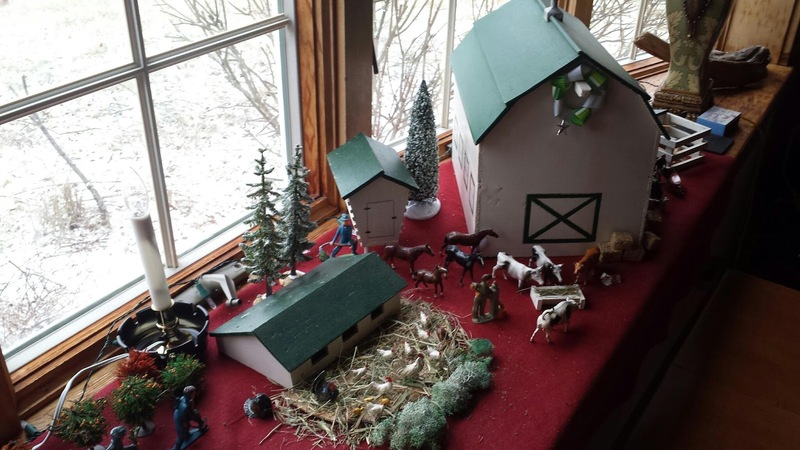 It had quite a few updates this year, some straw for the animals, a weather vane, the fruit trees were painted, and it was loved. There is a poem, a conversation, a burning ember from this putting up and taking down. It is a joy, that for me is also shadowed somehow, by the taking down, the end of the holiday, the hands that have touched this farm that are not here today. Would the joy and the nostalgia be different if i could shake off the story of how it was made? The B&W photos of the old Dickinson farmstead in Erma-- my grandfather with Mom as a little girl, my great grandparents on their 65th wedding anniversary? Knowing Uncle Levan was a talented sign painter and communicated by handing folks a pad and pencil to write on, because he was deaf? All of these stories, and more go up with the tree, and the inherited ornaments, with each chicken and lamb of the farm set. One by one they are recalled, with a smile, with some sorrow that this as passed, and I wonder if it is just me, or if the beauty I see in each of these things, the tug I feel from Christmases past are part of the elegance of this moment. Perhaps it is all a part of the Solstice season, when there is just less between this world and the spirits, and we are all able to be together for a brief celebration, before being returned to the box, and next year's memories. Until next year, Uncle! 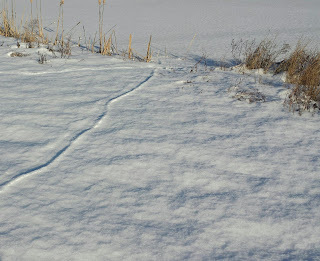 For most of the summer, we watched a muskrat going back and forth across the pond, usually with cattails in it's mouth. 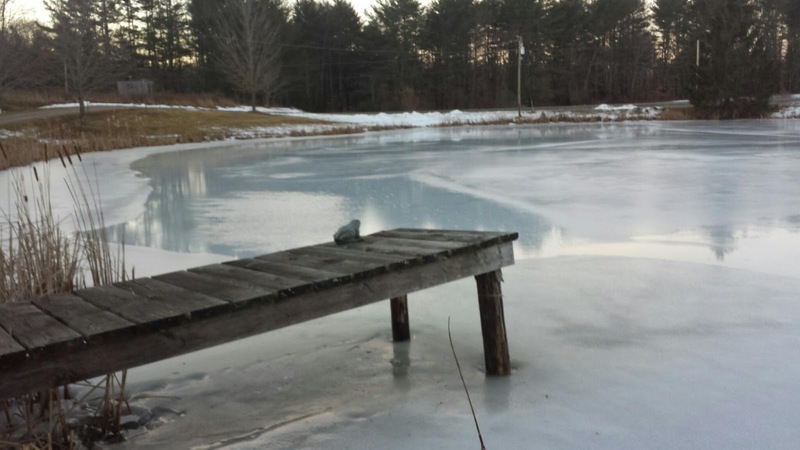 At first we had no idea what it was and Bev reminded me on more than one occasion, as I was about to go swimming, that in addition to the snapping turtle that belonged in Jurassic Park, there was an unknown something or other crisscrossing the pond. A conversation with the former owner solved the riddle. He reported that he often had muskrats, and they did a great job of controlling the cattails, and indeed, he has. 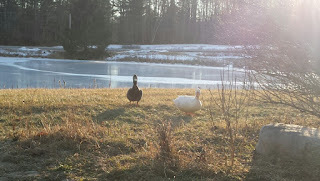 There are far fewer around the pond in previous years, and for this I am grateful. The other day, our next door neighbor, who I know very little after 4 years, I must confess, appeared to be working on his lawn tractor with the snowblower mounted to the front. We'd received quite a bit of snow, so I walked over with a shovel in hand to help. When I arrived, he reported there was a muskrat up in the snowblower...and I was mightily reassured to learn that it had not been run over, but ran up underneath when it got startled crossing the driveway. 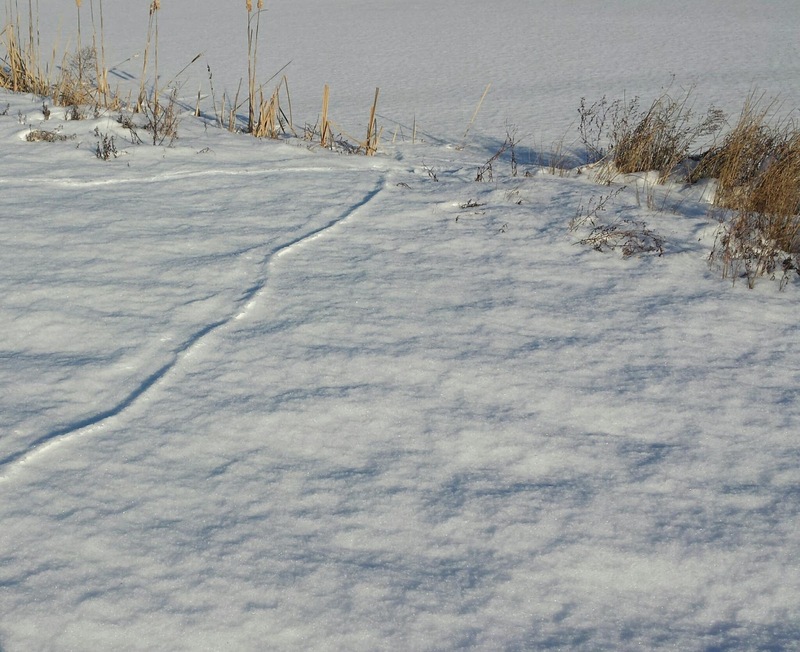 With a fishing pole and a couple shovel handles we convinced the muskrat to vacate the undercarriage of the John Deere and off he went, sliding along on his belly like a bobsledder . I was gld to learn that my neighbor would take the time to coax a startled muskrat out from under his tractor!